Author, Life and BPD Coach, A.J. Mahari, empowers loved ones of those with Borderline Personality Disorder to take care of themselves, cope more effectively with someone with BPD in their lives, and to find their own healing on the other side of BPD via her coaching services for loved ones of those with BPD. Sometimes that healing means dealing with ruptured relationships or ending a relationship. Other times for the loved one it may mean that the person with BPD has just dismissed them outright. Whether you, as a loved one of someone with BPD, are currently still in contact with the borderline in your life or not, there is a tremendous amount of pain and suffering on the other side of BPD . Suffering and pain that, for many, means loved ones also need their own healing and recovery. This is true whether one has experienced a relationship break-up is contemplating leaving or whether one is trying to make the relationship work. "I thought I had met the woman of my dreams - the love of my life. 9 months into our relationship I found out she had been diagnosed with Borderline Personality Disorder. I didn't know what that meant at all. It turned out that within 18 months there was no doubt in my mind that this woman ended up being my worst nightmare - determined to ensure we were enemies. I've never felt so alone in my life. I had never been in so much pain in my life. I turned to the internet and started to read up on BPD. As luck, maybe providence, would have it, I found A.J. 's sites. I then purchased a few of her ebooks and audio programs. They were so helpful but I was in so much pain. I decided to purchase some life coaching sessions with her and that was the best choice I could have ever made. A.J. really saw me through some of the worst pain of my life. She really helped me to understand what I needed to learn so that I could decide what path I needed to take. I would highly recommend that anyone who finds themselves in a relationship with someone with BPD talk to A.J. Mahari. She knows BPD inside and out. She cares. She listens and supports. She is so wise and so patient." - Mike J. - U.S.A. 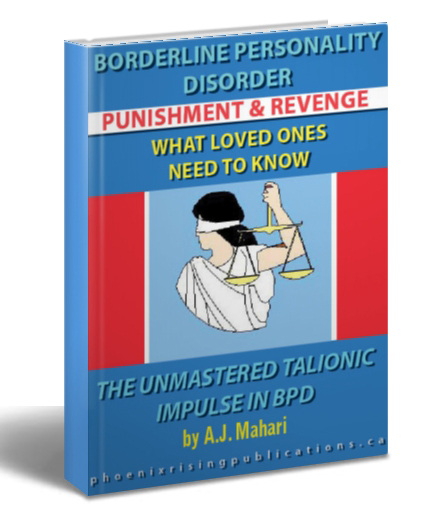 Many who come to suspect and/or find out that a loved one has Borderline Personality Disorder start from ground zero having been thrust into a world of their own hurt and confusion with no frame of reference to understand what is manifested in relationships by those with BPD or why. Working with me as your coach can and will help you to understand what you are going through and why. Even more importantly I empower my non borderline clients to set and achieve goals that help them to end their own confusion and suffering, whether they choose to stay in relationships or in contact with the person with BPD in their lives or not. If you are loved one of someone with BPD or have had someone in your life with BPD and you would like to move forward in your life and heal your pain and confusion and any remaining sense of wanting or needing closure please feel free to purchase and book a session or sessions with me. I would be happy to talk with you and to work with you. © The BPD Coach A.J. Mahari and Touchstone Life Coaching September 18, 2009 - All rights reserved. Ask A.J. 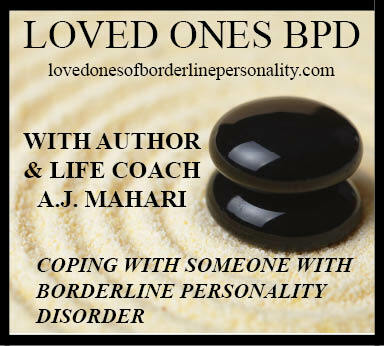 Mahari, the BPD Coach, what you most want to know more about Borderline Personality Disorder. Mother of Daughter With Borderline Personality Disorder - Coping with Splitting "I have an adult daughter who has BPD. She refuses to go see someone about her condition. The situation is escalating and wreaking havoc in her marriage and in her family life (she has an 11 year old son), and certainly with her extended family." "She switches from "acting in" but completely avoiding me or giving me the silent treatment, to "acting out" with horrible diatribes and being completely disrespectful. I have read much that you have written about BPD and I have found your material to be among the best at explaining to family members what's going on inside the head of a BPD, and how they are experiencing feelings of abandonment." "My question has to do with how I react when my daughter is both "acting in" and "acting out". During the "acting out" phase, she tells me she hates me, that I love her brother and his family more than her and her family, and she is beyond disrespectful, rude and hurtful. She takes reality of a situation and completely distorts it to match how she feels. I simply don't know how to handle these outbursts. I try to depersonalize them and to tell myself that she has a mental disorder, but it is crushing to me. She is rude, disrespectful and hurtful. In the "acting in" phase, she totally cuts me out of her life, never answers phone calls, and distances her entire family from me often times with me not even knowing what has precipitated this "acting in". She keeps my grandson from seeing me. The stress of life seems to overwhelm her at every turn." - Mother of BPD Daughter - U.S.
Overcoming Denial About BPD and Love that is in his home." © The BPD Coach A.J. Mahari and Touchstone Life Coaching September 17, 2009 - All rights reserved.